I am researching the McKinnell family who lived on what used to be Bourton Street in the 1940's and 1950's. (I believe Bourton Street no longer exists). The purpose of the research is to build an extended family tree. I think the McKinnells were 2nd cousins. In 1940 the family consisted of James McKinnell and his wife Sarah (Bamford) and children Alice, Dennis, Jack (John) James, Reggie, Sylvia (all unknown d.o.b), Elizabeth (Lily) b.1925, Ruby b.1927, Minnie (Mary) b.1931 - died 1934, Sarah (Sally) b.1937 and Violet b.1939. I think all of these 'children' have now passed away. I know some of the 'children' came to England in the 1950's and then emigrated to the USA. I am trying to find out when they left Belfast and where they went to in England, whether they had children, got married, what type of work they did etc. I guess I would need to make contact with someone in their eighties now that would remember the McKinnell family. Different address, but could this be a daughter ? Unsure if this is a relative or not ? Thank you for the information. The details re the parents (James and Sarah) confirm the info I have. Yes I also think the Alice is a daughter but I don't think the younger James is a son as the family were still living in Bourton Street at the time of his death. your family tree in draft stage because of your two entries for a Dennis looks like this draft after I found a date for Alice. I did not find the family in 1901 census why not a spelling variant or? Thank you very much for the information. It will take me some time to sift through it all. 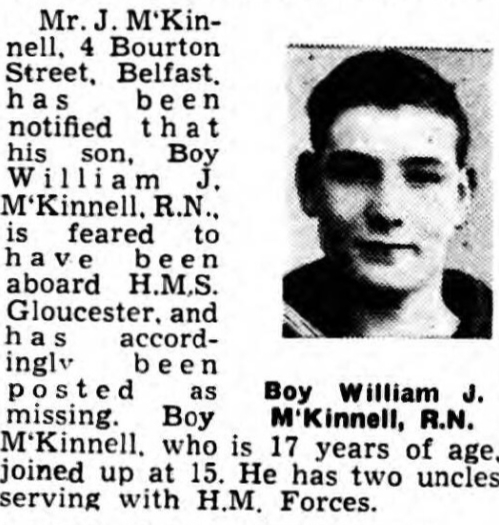 But at a glance, I have already found the McKinnells at Boulton Street between 1943 and 1960. As I have records of two of the children, Violet and Sarah(Sally), being in England in the 1950's then these are the people I want to concentrate on. I would like to find out when they came to England and where they lived and worked etc prior to emigrating to the USA. The other sister I can't find any records for is Sylvia McKinnell. Might be worth looking into this,even to rule it out ? For sambarry - Some of the names of your previous post tie in with the info I already have. It is interesting that it seems difficult to find records relating to the male 'children'. As I mentioned previously I think the 'Alice' is correct (so sad to find someone dying at that age). For JimG - I was already aware of the marriages of Violet and Sarah in England - they subsequently emigrated to the USA and along with their husbands, I believe they have all passed away. I didn't include the marriages (along with some other info) in my original post as I didn't want the post to seem too long. With those marriages now being confirmed my hope is that I can fill the gaps up to 1958 insomuch as where the siblings lived, type of jobs etc. Thank you very much to you both for your help. McKINNELL - December 1, 1934, at the Infirmary, Lisburn Road, James, dearly-beloved son of James and Sarah McKinnell (age 6 years). Funeral from 13 Moltke Street on Monday, at 2-30, to Shankill Graveyard. I am writing in the hope that you will be able to help me find Reggie McKinnell Twadell, my brother. He was taken during the war by a Mr. and Mrs. Twadell, who adopted him. They lived at 12 Caldagh Cottages, in Ballymena or Ballymoney. Our family then lived at 4 Bourton Street, Crumlin Road, Belfast. Later I moved to the U.S.A. and it is more than 30 years since I last saw my brother. I hope you can print this information. Maybe Reggie will read it and get in touch with me. The last I heard of him was that he lived somewhere in Belfast and had a paint store. Our parents were James and Sarah (Cissie) McKinnell. I hope very much that he will write. (Mrs.) VIOLET FOX 121 Brooklyn Street, Oak Harbor, Ohio 43449, U.S.A.
Sylvia was born 1943, still living in England.married john fitzpatrick in 1962(1935-1989), has four children Donna 1963 Kerry (Lynn)1964 John 1966 Michaela 1968.Sylvia joined the army about 1960,met and married John who was also a soldier. Dennis was a year older than Sylvia,he married a German lady but that's all I know. Mum last saw Sally and Violet when they came to visit us in Bury after their mother died so either late 1969 or 1970.Mum lost touch with her siblings-we were posted frequently to different places. Thank you for the info for 'Boy' McKinnell. So sad for someone so young to die in such circumstances. Also thank you for the letter by Violet McKinnell that was printed in the Belfast Telegraph. At least I now have a little more information about the male members of the McKinnell family. I have sent you a private message on this site. Please check your message inbox. I am in the US and also researching the very same family (specifically Violet, Sarah and Sylvia). I would really love to compare notes. Is there a way we could communicate directly? Looking forward to connecting.